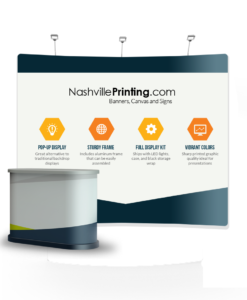 For the most portable, high-quality banner displays, get a banner stand from Nashville Printing.These banner stands are printed on 8 millimeter smooth vinyl to provide the most . These stand-alone banners stand head-and-shoulders above other banner stands because they are printed on lay flat vinyl and will not curl like ones made of inferior materials. The banners can be put on economy lightweight stands, or durable long term stands for longer or repeat engagements. Either way, the banner stands are easily set-up and taken down and provide the highest-quality portable banner presentation. 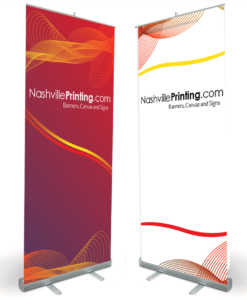 Be confident in your order with Nashville Printing with our 100% satisfaction guarantee. If you are not completely satisfied with your order because of something on our end, we will refund you or fix your order at no cost to you.